NEW HAVEN, Mo. 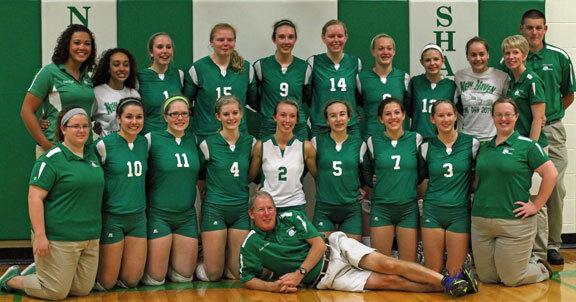 - The Lady Shamrocks are headed to Cape Girardeau for the Class 1 Final Four for the 10th time in hopes winning the schools fifth Volleyball State Title. 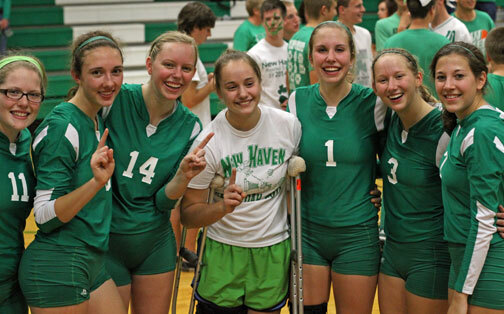 Saturday in front of a jammed packed crowd, on their home court, New Haven cruised passed Liberal in the sectionals match 25-15, 15-17 as they edged closer to advancing to the State Finals. In the Quarterfinals New Haven faced a much tougher Green Ridge (23-8-2) team, but still the Shamrocks dominated from start to finish taking them down in straight sets 25-16, 25-14. 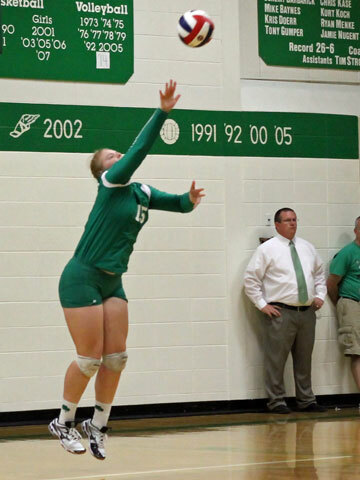 However there was a moment early in the second set where Green Ridge seemed to build a little momentum as they lead 7-5 when Senior Kayla Borcherding came through with a big time kill, just as she had all day. Photo by Kyle Quick of Kayla Borcherding. Green Ridge, now trailing 12-10, kept finding ways to stay alive. 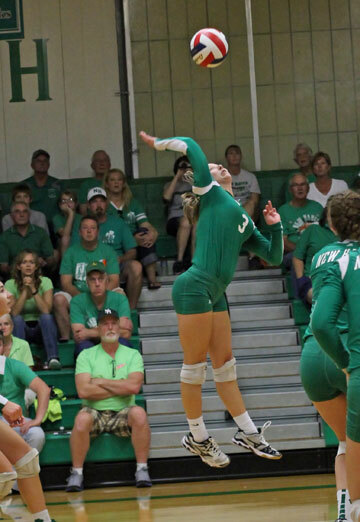 With Green Ridge serving Lauren Bergner’s tip kill gave New Haven a side out and a 13-10. 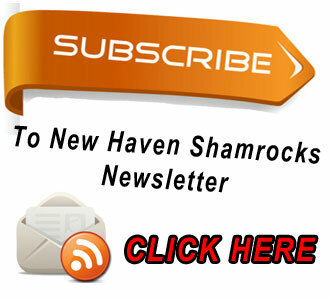 New Haven now with the serve in the hands of one of their best server, Bergner, the Shamrocks would explode for nine straight points led by Bergner’s down right nasty serves, which would end up being exactly what the Shamrocks needed. It could not have been more fitting how New Haven scored their final two points. Emma Borcherding’s first serve lead to New Haven getting a free ball, perfect pass, perfect set, and a smashing kill by Kayla Borcherding making it 24-12. Following a side out and a kill by Green Ridge (24-14) it would be just seconds before a perfect serve receive pass from Kayla Borcherding to Erin Scheer’s perfect back set to Taylor Covington who smashed her eighth kill in the game, giving New Haven a 25-14 second set win and a trip to the Class 1 final four. After the game Coach Hoener talked about Kayla Borcherding and Emma Borcherding’s (note: they are not sisters) outstanding play. “It seemed like every time we needed a big play Kayla delivered and Emma Borcherding as well. I thought Kayla played her best two games of the year”, said Coach Jaime Hoener. Saturday it was New Haven’s outside hitters who delivered, unlike the vast majority of the season where it’s been their middle hitters who’ve been nearly unstoppable at times. Hoener elaborated more about this saying, “ Our outside hitters carried us today where normally it’s our middle hitters and today with the way our passing ways and setting, our outside girls just did it. It was really good to see Emma and Kayla step up at such hard difficult times and be able to power through. The greatest play was made seconds after the game and one very special moment one player will always remember. After New Haven won the entire team ran back to their bench, surrounding and hugging Katie Peirick, which was the perfect example of how much of a team the shamrocks truly are. Senior Katie Peirick returned at the beginning of this season after having suffered a season ending knee injury last year. After a long summer of rehab Peirick returned for her senior year. Then during warmups of New Haven’s seventh game of the year at the Show-Me Shootout in Cape Girardeau Peirick’s career would come to an end after suffer the exact same injury but this time to her other knee. A very talented and smart athlete, and while her ability to play may have been taken from her, it’s been Peirick’s knowledge of the game that has made her a vital asset and playing an instrumental role to New Haven’s success. Coach Hoener said, “Katie had surgery the same day that we played Fatima and had watched the game live and then next day she had all kids of things to tell us of things we had done wrong that night. With their win over Green Ridge New Haven improves to 31-5 on the year and has won their last five games all of them in two sets. The Shamrocks will begin Friday’s Round-Robin play at 9 a.m. against St. Vincent (25-11-1). Then at 11 a.m. they will take on Santa Fe (31-2-1), before playing Winona (26-5-3) at 1 p.m.
All three games will be streamed live right here on QuickNewsNow. For a complete schedule as well as more info for both Friday and Saturday visit the Sports Zone. Admission will be $7 and parking will be $5.